These overhaul balls are more affordable because they do not include a thrust bearing swivel on top. Each ball can be equipped with the new McKissick US-422T Wedge Socket which can be easily adjusted to fit various sizes of wire rope by changing the wedge (important to ensure that correct wedge is used for selected wire rope). 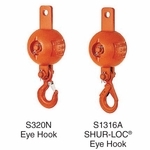 Choose between standard S-320 Eye Hooks or S-1316 Shur-Loc Hooks...both hooks are made from forged alloy steel and factory-equipped with safety latches (latch depends on hook, and hook is determined by size of overhaul ball). Safety factor of 4:1.